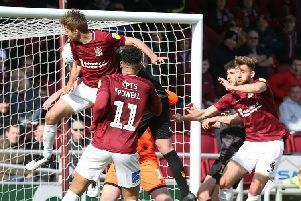 The Imps won promotion despite only managing a point at Sincil Bank as Waters helped keep the Robins one place and one point behind the Cobblers in Sky Bet League Two. 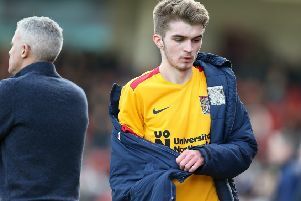 Joe Bunney lasted 67 minutes for Rochdale who were unable to ease their relegation fears with a 4-1 defeat at Portsmouth, which leaves them one spot above the bottom four in League One. Young striker Joe Iaciofano started for Banbury United as they drew 0-0 with Leiston in the Southern League while both Camron McWilliams and Jack Newell again missed out for Corby Town with injury. Matthew Slinn’s recent fine form continued but he couldn’t prevent his Cogenhoe United side from losing 2-0 at home to Eynesbury Rovers. Meanwhile, Matt Crooks bagged his first goal for Rotherham United since joining from the Cobblers, scoring a crucial late equaliser at Stoke City, and Hiram Boateng, a former Town loanee, won Sky’s Goal of the Weekend with a stunning volley for Exeter City.